Searching for a sustainable and socially responsible business venture, Jonathan and Glorya Iesalnieks kept coming back to the idea of a chemical-free cleaning business. When it comes to cleaning companies, we want them all to be chemical free! We pursue health and an active lifestyle in everything we do. The truth is, with so many chemicals in our environment, the best we can hope for is to eliminate exposure to the ones we have control over. The ones in our own homes! And of these chemicals CLEANING PRODUCTS top the list! Through our own research and the diligent research of others, we found natural alternatives to the toxic products we regularly use in our homes and expose our family and our pets to. We believe by giving our customers a PureClean, we can contribute to the health of others as well as make a contribution to the environment. With products that are safe enough to eat! You won't find a health warning label on any of our products. As a partner in the company Jonathan Iesalnieks, R.G.D, is a addicted to the outdoors and healthy living. He lives a very active lifestyle. He is an avid fisherman, hockey player and great lakes surfer. His background includes 15 plus years in corporate marketing and branding. Jonathan is certified by the CMA in Integrated Branding, and is a registered graphic designer. He and his wife Alison are the proud parents of a beautiful 4year old daughter. After years in the cleaning industry, Glorya Iesalnieks joined a team of sales representatives in the air filtration business. 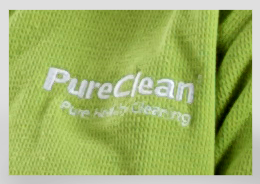 Spending the next 14 years learning the ins and outs of clean air and its effect on our health, PureClean seemed the logical next step in the clean living she enjoys. Education is power ….and we can all benefit from the education of others while we educate ourselves and our families on a PureClean living! No harmful chemicals in the air are left behind on your floors, furniture and appliances.